The museum makeover will begin at its entrance, the Square, to become a more convivial place to gather and relax. 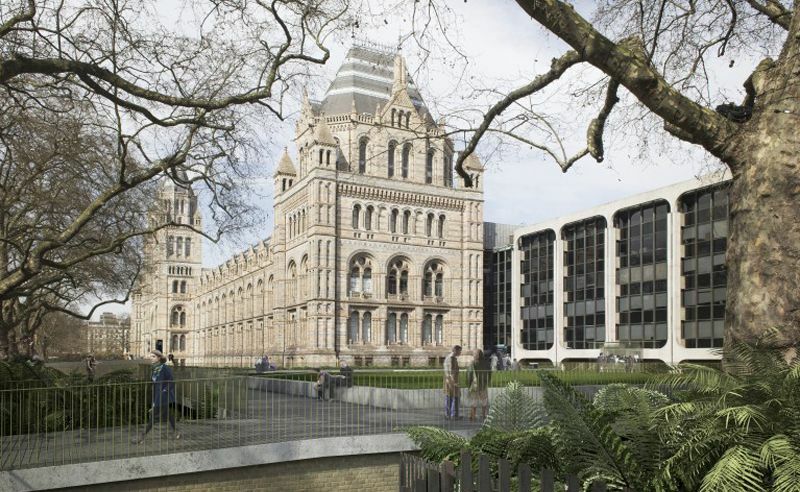 Two London-based firms, Niall McLaughlin Architects and landscapers Kim Wilkie, have designed new features that will enhance the city's Natural History Museum's access, grounds and wildlife garden. London's Museum of Natural History first opened its doors in April 1881, but it has its origins over a century prior. Sir Hans Sloane, who travelled internationally as a high society doctor and collected natural history specimens, proposed the initial concept. After his death in 1753, Sloane's will allowed Parliament to buy his 71,000-item collection. The government agreed to build a museum -- the British Museum -- to both house these artifacts and display them to the public. The collection was further fed by Victorian explorers' findings, with new species of exotic animals and plants from all over the British Empire. The Natural History Museum remained part of the British Museum until 1963, only officially receiving its current name in 1992. The museum's striking Romanesque structure can be attributed to 19th century architect Alfred Waterhouse, who ingeniously used terracotta -- being more resistant to Victorian London's harsh climate -- as a key material. The museum makeover will begin at its entrance, the Square, to become a more convivial place to gather and relax. Meanwhile, the Eastern Grounds will feature a new bronze cast of a Diplodocus -- separate from the 'Dippy the Diplodocus' signature currently in the Museum's central hall, which will incidentally leave the museum in 2017 to go on a UK tour in 2018. The Eastern Grounds will also feature a geological timeline of the Earth's evolution, with careful landscaping to facilitate the storytelling. The Western Grounds will be expanded with a Wildlife Garden double the size of the current one, with three quarters of the plant life found in its current iteration amidst the urban greenery. "With over 5 million visitors every year, we have an incredible opportunity -- and responsibility -- to inspire many more people to learn about nature," the museum spokesperson said in a statement. "We believe the plans will do just that, all the way around the museum rather than in just one corner." Having been granted planning permission this fall, the museum is now in the fundraising stage and aims to complete renovations by 2020. Meanwhile in New York, an ice cream museum has opened its doors.